Sweet music. – Dirty wet dog , boats and sailing. Those of you that follow my posts will know that once i get an idea i tend to chew on it until i am well down to the bones and recently i have been thinking a lot more about the kind of boats that i might be able to keep at home. This post follows the idea of the small boat out to an obvious conclusion which is to look at the kind of boat i would really like to own in this size rather than accepting the compromise of the boat that i could just go out and buy and which would be the same as everyone elses boat of the type : i am thinking here particularly of the Wayfarer dinghy which while it is an excellent boat and does what it says ‘on the tin’ but still strikes me as being a bit dull and worthy. The international 18 on the other hand is a boat that definitely gets me moist : a big powerful planing dinghy that in the right (or wrong) hands will take on a J24 any day, as i have mentioned before there is one down this way somewhere with a carbon lug rig and is a very good fast cruising boat. The Wayfarer just doesn’t ‘speak’ to me in any way but might be a very good boat to own temporarily to get the feel for sailing a dinghy : remember that i have never really done that so i don’t assume the competency required, but at the same time seriously look into the use of project time to build a boat from new rather than trying to upgrade a 40 year old GRP hull. I do have the time i think to do one or the other as long as the build is relatively simple and/or the major refit doesn’t create a massive gear budget : around 25 feet is about the limit. I did briefly kick around the idea of building the Dudley Dix retro 28 which would be an excellent boat but the cost of its rig and sails would be prohibitive. The boat in focus here is an Ian Oughtread design : his Caledonia Yawl and it does speak to me , i note that plenty of them have been built and i haven’t heard a bad word about the boat so far. All of the pictures i have studied suggest that there are lots of different ways to fit the boat out : from half-decked forward to give bow bouyancy, lockers and seats aft or completely open boat and even different rigs although its the lugger that appeals most. For a dinghy/dayboat its quite a long boat but gets shorter to tow and store with the rudder off and the spars are shorter than say a bermudan alternative. I think that it is possible to buy a kit with all the major parts already cut on a CNC router and a strongback/molds kit to make the whole job easier plus there are a few builds noted on the internet. Downside is that my garage is neither big enough or dry enough for a build of this size so i would still need to rent space at the yard and inside the shed and do a relatively fast build maybe with some degree of professional help to get the hull done properly first time. Other downsides : might be just a tad too long at home without modifying the entrance to the drive (might not) and it would definitely need a custom trailer and a decent towing vehicle but maybe not a super-duper and fuel-hungry 4×4. Peter Cash wrote : “Oughtread pens beautifull boats, his plans are very detailed . 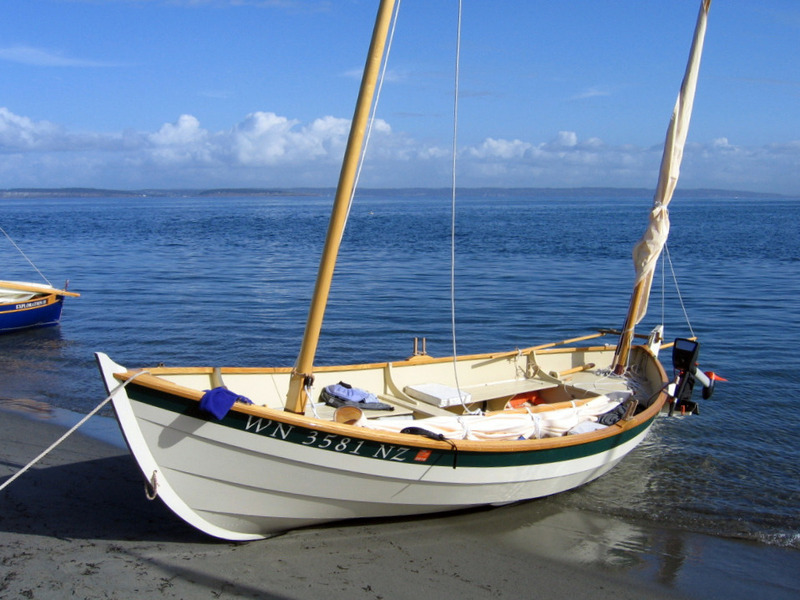 Our Wee seal mk2, built by John Newbold of wooden boat fame, looked and handled like the thoroughbred Ian drew. Love cuddies but am drawn to open boats because of the looks and often the absence of a ballast keel which really helps trailer recovery and storage. Drascombe long boat for sale here so am tempted. Need a glass boat handle our hot summers, kills woodies unless in covered storage. Glad to see you thinking of building and considering some pro help to get the hull built. Can you buy a tube for the dibly mast and build it up yourself ? Although a refit seems less daunting we have all seen the delights of old boats….. and the can of worms they can be. Oughtread pens beautifull boats, his plans are very detailed . Our Wee seal mk2, built by John Newbold of wooden boat fame, looked and handled like the thoroughbred Ian drew. Is there a second hand market for winches etc in the UK Europe ?